Rondón is a municipality in the Colombian Department of Boyacá, part of the the subregion of the Márquez Province. It became a municipality by ordinance No. 05 of 30 June 1905. 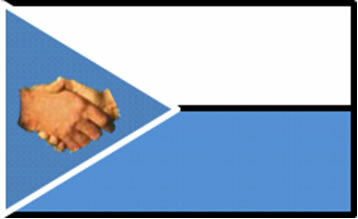 The image of the flag of Rondón at the municipal web site show it as horizontally divided white-blue with a blue bordered white triangle at the hoist which is charged with shaking hands. However, according to the description, the bottom stripe should be green. 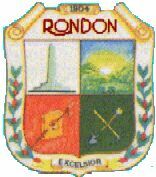 "The flag of Rondón was adopted by Decree No. 032 on 10 September 1995. The triangle auroceleste (?) at hoist recalls the village through the historical image of its foundation, the two strong hands symbolize friendship, work and unity, the Y-shaped light blue stripe represents victory, joy, generosity and honour to the hero of the Vargas swamp, Colonel Juan José Rondòn. The white stripe symbolizes the link of the inhabitants to their land, their imponderable virtue to the service of wisdom and the decision to maintain the unity among our people. The emerald green stripe represents our fertile fields, friendship, faith and hope in the future of the village. The colours are distributed as follows: an auroceleste triangle along the hoist, whose two vertices merge in the geometric center of the emblem, in the center of the triangle are shown two interlaced strong hands, flesh-coloured with visible wrists; an Y-shaped light blue stripe of 10 cm in width, starting from the hoist and reaching the center of the right edge of the flag. The lower part of the Y is emerald green while the upper part is plain white, the dimensions are the same as for the national flag." From the description, I understand that the lower stripe is green and that the two horizontal fields are separated by a light blue stripe. "Vargas Swamp Lancers or Monumento a los Lanceros is a large sculptural complex realized by Colombian artist Rodrigo Arenas Betancur in the department of Boyacá (Colombia) as a memorial for Vargas Swamp Battle. It is the largest monument in Colombia. This monument depicts the attack of the 14 lancers commanded by Colonel Juan Jose Rondòn. It is 33 m high and was dedicated in the 150th anniversary of the Colombian Independence Day. In July 1819, while marching against Santafé, the army of Simon Bolivar, exhausted after passing acros the Pisba paramount, faced the Spanish army commanded by Jose Maria Barreiro. Although the location was better for the Spanish, and the Liberator army had bad odds, the attack of the 14 lancers armed only with lances was decisive in the winning of the battle."